Manteo is a town in Dare County, North Carolina, United States, located on Roanoke Island. On the 10th (Fri), take in the dramatic natural features at Jockey's Ridge State Park. 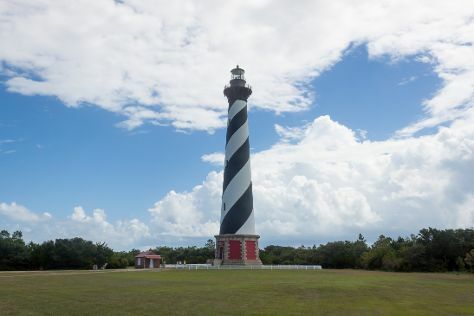 On the next day, take a leisurely stroll along Jennette's Pier, enjoy the sea views from Bodie Island Lighthouse, then explore the galleries of Wright Brothers National Memorial, and finally take a memorable tour with Tours. For more things to do, traveler tips, other places to visit, and other tourist information, you can read our Manteo driving holiday tool . Dayton to Manteo is an approximately 6-hour combination of taxi, flight, and car. You can also do a combination of taxi, flight, bus, and car; or drive. Traveling from Dayton in May, plan for a bit warmer nights in Manteo, with lows around 61°F. Wrap up your sightseeing on the 12th (Sun) early enough to drive to Hatteras Island. Start off your visit on the 13th (Mon): visit a coastal fixture at Cape Hatteras Lighthouse, then enjoy the sand and surf at Salvo Beach, and then take in the waterfront at Avon Fishing Pier. On the 14th (Tue), you'll have a packed day of sightseeing: look for gifts at Lee Robinson's General Store, kick back and relax at Frisco Beach, and then kick back and relax at Haulover. To see ratings, maps, and other tourist information, read Hatteras Island trip itinerary builder tool . Drive from Manteo to Hatteras Island in 1.5 hours. In May, plan for daily highs up to 76°F, and evening lows to 63°F. Finish up your sightseeing early on the 14th (Tue) so you can travel to Ocracoke. Ocracoke is a census-designated place (CDP) and unincorporated town located at the southern end of Ocracoke Island, located entirely within Hyde County, North Carolina. Kick off your visit on the 15th (Wed): steep yourself in history at British Cemetery, then take in the exciting artwork at Over the Moon, then get engrossed in the history at Ocracoke Preservation Museum, and finally tour the pleasant surroundings at Ocracoke Lifeguarded Beach. Keep things going the next day: hike along Hammock Hills Nature Trails, then enjoy the sea views from Ocracoke Lighthouse, and then look for all kinds of wild species at Springers Point. For ratings, traveler tips, reviews, and more tourist information, read our Ocracoke route planning website . Do a combination of car and ferry from Hatteras Island to Ocracoke in 2 hours. In May, daytime highs in Ocracoke are 76°F, while nighttime lows are 63°F. Cap off your sightseeing on the 16th (Thu) early enough to travel to Rodanthe. Rodanthe is an unincorporated community and census-designated place (CDP) located in Dare County, North Carolina, United States, on Hatteras Island, part of North Carolina's Outer Banks. Kick off your visit on the 17th (Fri): take a leisurely stroll along Rodanthe Pier, then enjoy the sand and surf at Pea Island National Wildlife Refuge, and then make a trip to Chicamacomico Life-Saving Station Historic Site & Museum. To see other places to visit, traveler tips, and other tourist information, you can read our Rodanthe trip builder website . Traveling by car from Ocracoke to Rodanthe takes 2.5 hours. Expect slightly colder evenings in Rodanthe when traveling from Ocracoke in May, with lows around 58°F. Finish up your sightseeing early on the 17th (Fri) so you can travel to Corolla. You'll explore the less-touristy side of things at The Monument to a Century of Flight and Carova Beach. There's much more to do: visit a coastal fixture at Currituck Beach Lighthouse and Museum, fly like a bird with a parasailing or paragliding tour, tour the pleasant surroundings at Currituck Banks Reserve, and identify plant and animal life at Outer Banks Center for Wildlife Education. For reviews, where to stay, ratings, and tourist information, read Corolla trip itinerary planning app . Traveling by car from Rodanthe to Corolla takes 1.5 hours. In May, plan for daily highs up to 78°F, and evening lows to 60°F. Finish your sightseeing early on the 20th (Mon) so you can travel back home.